Although the current jobs market is very busy, practices are only looking to employ the best candidates and your CV has to stand out to gain an interview. There are many possible formats but below are 10 points we feel are essential to achieve a successful CV. There is no need to write Curriculum Vitae at the top. Exclude any unnecessary text and keep the CV clutter free. Double check numbers and emails are correct. It is amazing how often this is overlooked. This is a great opportunity to personalise each application and highlight relevant skills and ambitions. Unless it is particularly relevant to a job, don't include every module you have done, but do include overall grade. Education should ideally be on the first page as this instantly highlights your level of experience. - Short company profile. i.e. number of people, main sectors, web address. - Your position within the firm. Did you manage a team? - The main projects you worked on, including contract value, stages of work and brief overview. - Don't have background images with text overlaid. - Don't have images at strange angles or within tiny circles. - Small plans and sections are generally unreadable within an A4 CV. - Do try to make all the images line up and fit the space. - Use professional looking photos, ideally of completed projects. Continue in the same format, but write less on each firm as you work backwards. Keep the main focus on your most recent role. Logos invariably look clunky, so we wouldn't advise including them. Do, however, write the number of years you have worked on the main systems. This is a chance to highlight any achievements and awards. If these are non architectural, make sure these don't dominate the CV. Sometimes it can appear you really want to be working in another industry and not really interested in the role on offer. 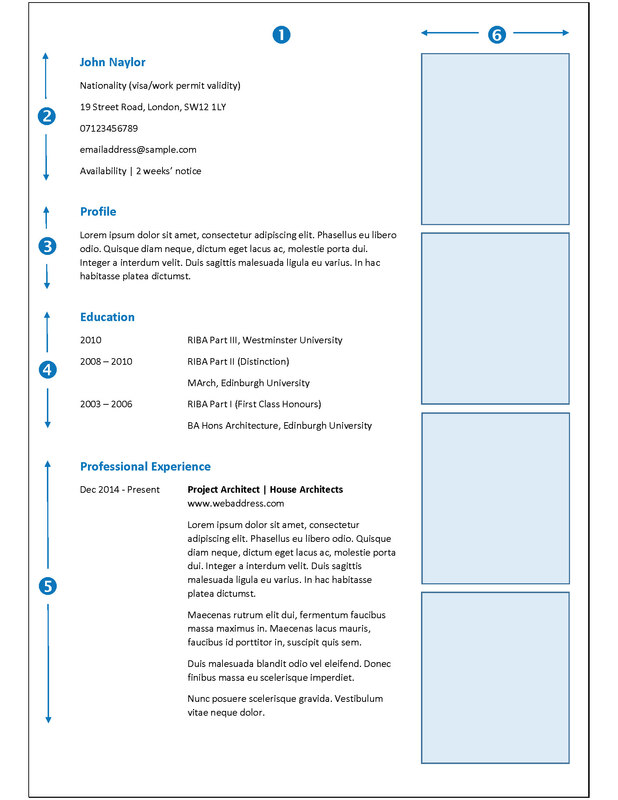 It is always worth adding references to support the content of your CV. Just be careful who you include in case they are called without your permission. Keep file sizes ideally below 2MB. Limit the number of ways you choose to highlight titles. Try to create a consistent brand across everything you present to an employer. Spell check your CV. If you have titles in capital letters, spell check will often miss any errors. Although you should include images of work, your CV should not be your whole portfolio. The CV is a snapshot of your career and experience and your portfolio can then be presented at the interview stage. 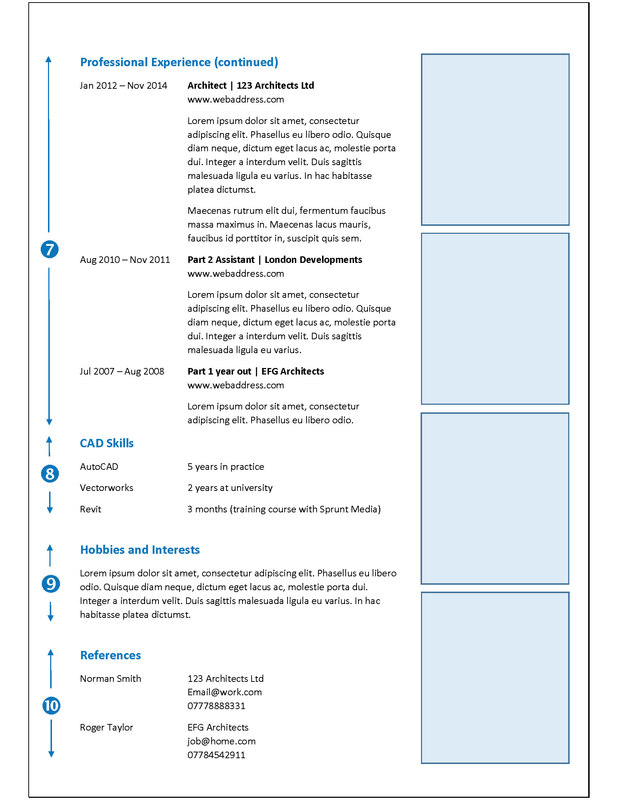 Send your CV as a single PDF document. Word documents can lose their format. Never write text at angles. Don't write your whole CV in capitals as it becomes particularly difficult to read. When emailing CVs, keep the background white so practices can print without using all their ink.